I am turning a deaf ear to the horrific news that has been permeating the air waves for months now. Not that I don’t care or have the greatest sympathy for those made to succumb to man made chaos, such as the oil spill in the Gulf and the nuclear leak in Japan, to name a few. The very sanctity of the earth is being disrupted by the powers to be and it would seem that Mother Nature herself is rebelling (rightfully so) against this total disregard for her laws. Yet, on occasion she offers a phenomenon that, if we take the time to notice, proves her power over all. Such is the reason I headed out Saturday night to chase the moon. Having read that a “super moon” was to appear on March 20th I felt the need to be proactive—to support nature and praise it’s life- giving properties. 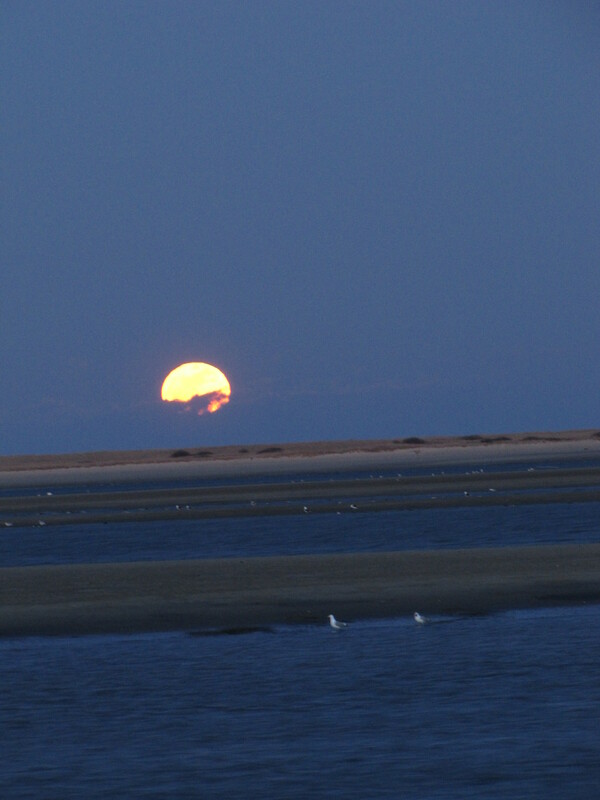 And so, my friend Cathy and I packed up some wine and cheese and headed to the Chatham Fish Pier—an easterly point on Cape Cod– for the “promised rise”. To our surprise the place was packed with locals, equally excited to stand in bone chilling wind to “wait for the light.” The expectancy was palpable—the crowded pier heartwarming. It seemed that I wasn’t the only one craving hope in her heart. Sure enough, some ten minutes later than predicted, there appeared a swash of pink and orange and seconds later a half circle which soon became a full blazing ball on the horizon, and voila, we had our spectacle—a giant orb, uncharacteristically huge, almost seeming out of place, the color of the sun not the moon– an upside down moment that utterly captivated. I expected everyone to break into cheers and a round of applause, but instead the spectators were strangely silent—it was as if we were experiencing a sacred second and collectively needed to honor the inexplicable. There was no reason or justification for the moon making its closest approach to earth in 18 years—it just seemed to happen. Although much is discordant and unsteady on this earth, things in the heavens run smoothly as if by clockwork. As I sat and relished the sight, it occurred to me that there was no controlling this occurrence, nor do we have any control over the rising sun, the tides, the seasons. We are made to accept the ebbs and flows but if we are alert and awake we must seize the day when nature presents us with visible miracles. A strange sweet melancholy filled the car. We had both endured a tough year and in need of witnessing something bold and hopeful—to be buoyed, I suppose, before we were made to walk back into the darkness. “Do you remember the old farmer we met on Iona last year?” I asked my friend as we sipped our wine. As I’ve learned over the years to find solace in the natural world, this recent bold reminder affirms that even though I can’t control the chaos that abounds, just LOOKING can be a satisfying act of kindness to myself—a necessary peaceable act to keep me going. May you find such peace by simply sitting still and waiting. we were in maui during the anticipated tsunami (which did little damage there) and were so grateful when we were able to return from higher ground to find that the water had come in within feet of the lanai at our condo but everything was intact for the most part. 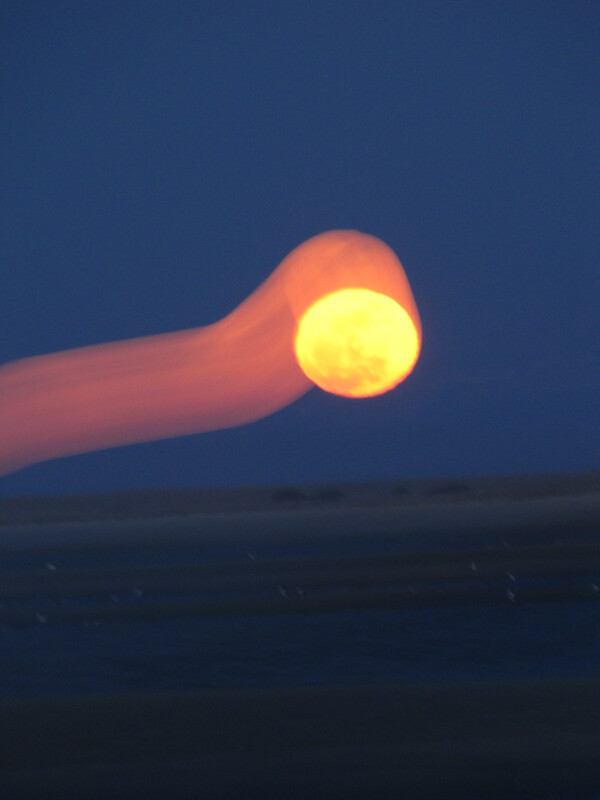 i took a photo of the sunset the day after the tsunami and to my surprise, your photo of the moon looked just like it. this was my first visit to your blog and it felt like a personal welcome to see that beautiful photo along with your wise words about nature. thanks for all you give to women who are finding themselves again in the afternoon of our lives. personally, i love it and am grateful to have found your writings as an enrichment to my life. Thank you for sharing! I wish I had been there! I was exhausted from consecutive weeks of 14 hour days but was determined to go out that night, also with camera in hand. My best chance of getting the “super moon” over water was a local resevoir. When I arrived I was surprised that only 2 other people had the same thought. However, one was walking a dog so I feel that person might have just happened upon the moment. I couldn’t help but think, “Why aren’t there more people out here?” People will run or stare or crane their necks to see a disaster – man made or made by nature. Yet, when Mother Nature presents us with such a gift they stay away. This may sound odd, but I plan our vacations around the full moons. And always have my camera ready. Your pictures are “amazing”! Thanks for sharing as you always so graciously do…….Awesome!! At least you got to see it – it was cloudy and overcast here. I was very disappointed. Joan, loved your message. Thank you for mentioning your blog and asking me to share my poem with everyone. I hope it is enjoyed. Or did the moon chase me? Standing on tiptoes to see. To see it rise above the sea. On this clear and starry night. Travel ‘tween the moon and me. You have a ‘gift’……Thanks for sharing…. As always, your writing stirs my soul, feeds my mind, and gives me hope that I am not alone in how I view things in the world. I had the honor of meeting you once, and looking into those incredible deep blue eyes that seem to see the good in people, and I hope to have the privilege again one day. Thank you for doing what you do. Thank you, Joan! I, too, witnessed the huge moon that evening, but in a warmer place in Texas. It was awe-inspiring and I also felt the grace and enormity of Nature. Thanks for sharing your striking pictures. Joan, as usual, a beautiful writing. Thank you so much. I loved the photo. How spectacular.